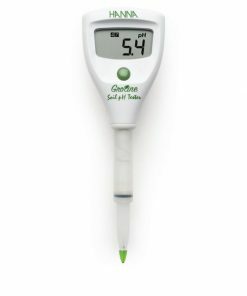 View cart “HI981030 GroLine Soil pH Tester” has been added to your cart. THe HI98318 is our latest pocket meter for measuring the EC/TDS of a hydroponic nutrient solution. This modern looking meter is only 0.7″ thick and extremely ergonomic, fitting comfortably in your hand. The HI98318 has a very large easy to read LCD display that shows both EC or TDS and temperature along with calibration, stability and low battery indicators. All operations are simplified to two buttons. One is for turning the meter on/off and the other for automatic one point calibration.